The snake, which is not native to Maine, was later claimed by its owner after it was taken to the Animal Welfare Society. A Biddeford resident had an unexpected visitor Tuesday afternoon. 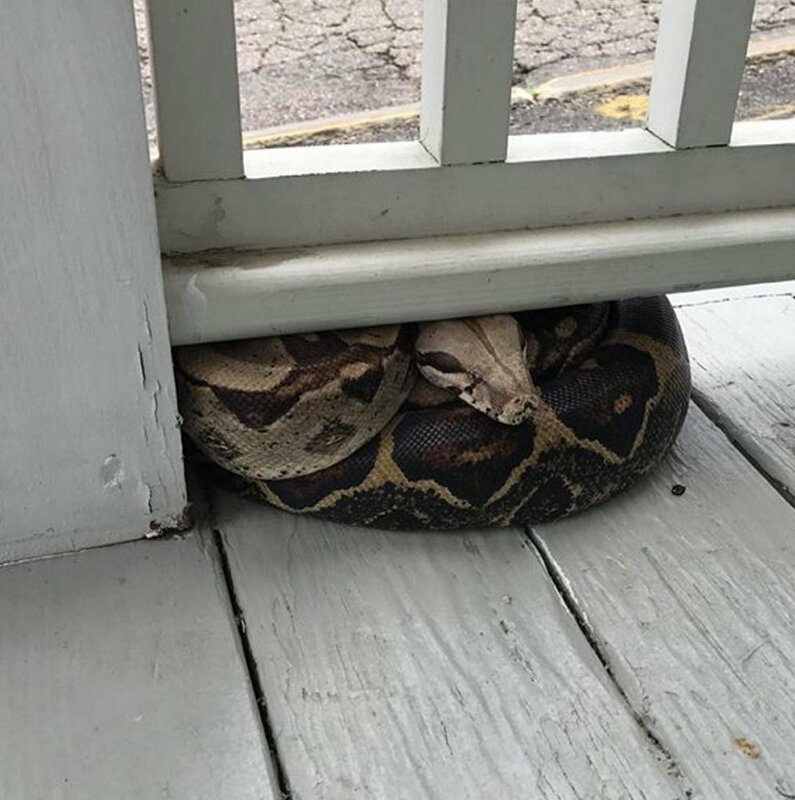 A 5-foot red-tailed boa constrictor was found curled up on the porch at 68 High St. The snake is not native to Maine. Police were called to capture the boa and they posted photos of it on Facebook – it quickly became something of an online sensation, according to WCSH. The boa’s owner claimed the snake later on Wednesday after it was taken to the Animal Welfare Society in Kennebunk. “We got a call at 1:54 in the afternoon from a person reporting a large snake curled up on the front porch of the place,” said Deputy Police Chief JoAnne Fisk. Animal Control Officer Garth Russell headed over to High Street and was able to capture the snake and put it in a pillowcase. 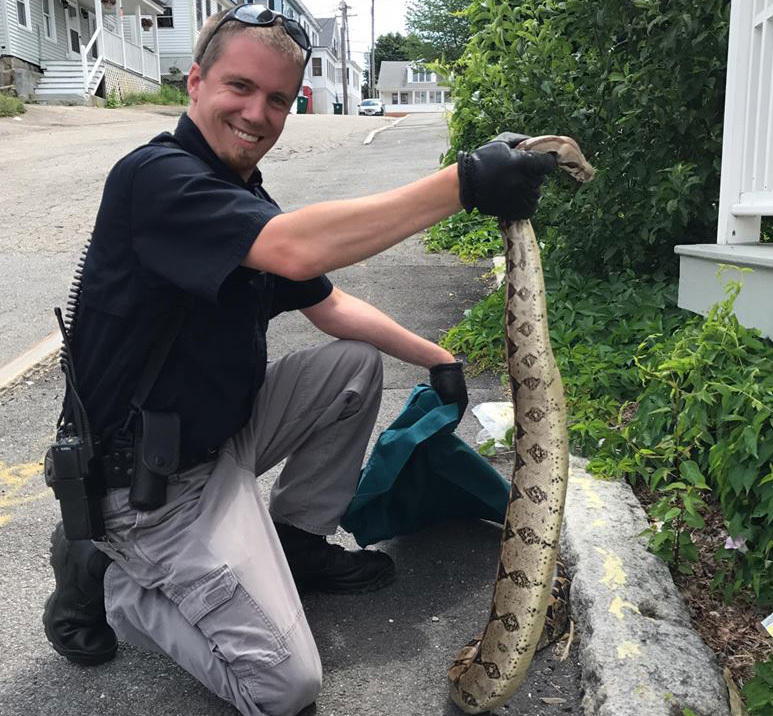 Photos of the snake on the porch and of Russell holding it were posted on the page for the Southern Maine Animal Control Group, where local animal control officers and animal welfare groups post information about lost pets. Red-tailed boa constrictors are frequently kept and bred in captivity. They typically grow to a relatively modest 6 to 10 feet long. Last year, a woman checking on a vacant house in Biddeford found a 3-foot python that had found its way inside. That snake was retrieved by the Maine Warden Service. The discovery of the red-tailed boa in Biddeford on Tuesday also brought back memories – and lots of jokes on Twitter – about a much larger snake that was spotted multiple times in Westbrook last June. That snake, dubbed Wessie by locals, was believed to be about 9 feet long. People reported seeing it feasting on the remains of a beaver and swimming across the Presumpscot River near a local park. A large snakeskin found in the area was later identified as having come from a green anaconda, a native of South America and one of the largest snake species in the world. The snake itself was never found. Wessie continues to have a large social media following with cheeky posts on Twitter. The snake’s alter ego, “Wessie P. Thon,” on Wednesday responded to questions asking if he was the snake found in Biddeford.